The Rubber Cafe Design Team Blog: I Fancy You! Ack! These little cuties are getting all cozy for Valentine's day!! 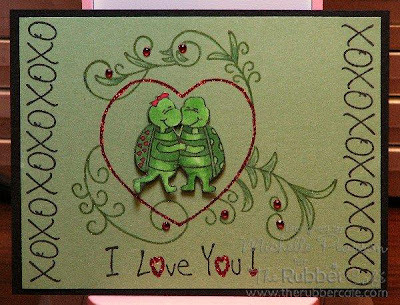 I Fancy You is a complete stamp....you get the frame and the turtles. I stamped the image in green ink and then traced it with the Olive Spica Glitter Pen. I cut out the heart and some of the greenery to make a small frame for my little lovers! I glittered the heart with some Cranberry glitter. The turtles also come separately in Dancin' Cheek to Cheek, so I stamped them again in black ink and then colored them up with Copic Markers. 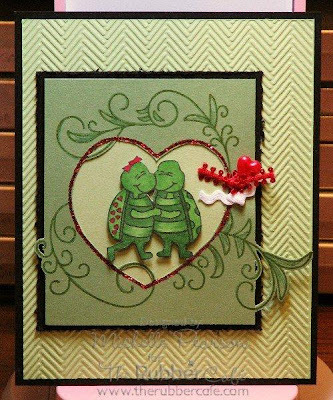 Here is another version I did with less cutting and a few more fun Valentine stamps! XOXO comes from the set Labrador of Love. I stamped it along the edge of the card as a border. I Love You comes from the set Sweet Kitty. I added some more Cranberry glitter and a few gems for a bit of bling! This is too adorable! Excellent cutting job!! !